Staff at a paediatric emergency unit in Cardiff took matters into their own hands to answer the question: how do nurses collectively improve knowledge and skills under environmental constraints? Emergency nursing is a highly skilled, rapidly evolving speciality and as nurses we are obliged to keep up with these changes. The challenges have been well documented: increased waiting times; a reduction in national bed numbers; increased patient attendances; limited resources and decreasing funding. These are all making it difficult to deliver ‘shop-floor’ teaching and structured educational packages for staff. Furthermore, with recent terrorist threats and major incidents seemingly becoming a more regular occurrence nationally, it is essential that front-line nurses are equipped educationally to deal with these complex and stressful events. The paediatric emergency unit (PEU) at the University Hospital of Wales in Cardiff has more than 34,000 attendances a year, and is staffed exclusively by trained paediatric nurses. There is no designated protected time for teaching in the PEU, even though nursing staff everywhere are required to keep their practice up to date. Our hospital is currently bidding for major trauma centre status for South Wales, which, if successful, will increase the need for nurse development. Like many other emergency departments, we have a relatively young and inexperienced nursing workforce comprising staff of different backgrounds. Because of this, individuals’ knowledge varies significantly and some lack elements specific to emergency nursing. The RCN National Curriculum and Competency Framework for Emergency Nursing, published last year, highlighted the need for, and value of, a well-educated, up-to-date workforce, and the impact such a workforce has on the delivery of high-standard care. The RCN framework provides a blueprint for what needs to be taught and learned, but not how to deliver it. It is possible to have effective, sustainable teaching in a busy paediatric emergency unit without disrupting service provision. Teaching over a concentrated period is well received when a variety of teaching methods are used. 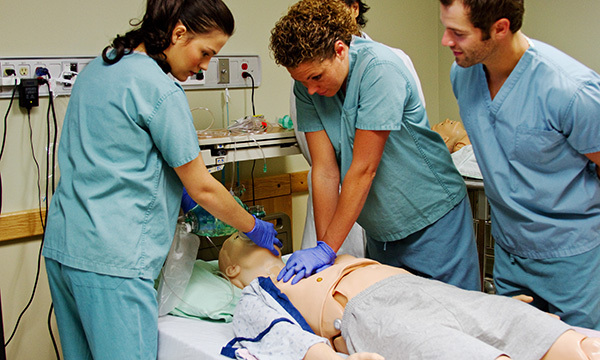 Nurses can deliver effective teaching to their peers. Given the opportunity, emergency nurses rise to the challenge of formulating new ways of developing their practice. As a group of nurses, we asked ourselves how do we, collectively, improve our knowledge and skills given the constraints we face? This article examines how we went on to develop a teaching package that could fit around our working environment and our work demands. The focus is on the design of the programme and how it could be easily adapted to deliver different content depending on the needs of the workforce at the time of use. We aimed to develop and implement an education programme for the nurses, run by the nurses. It had to cover contemporary topics that nurses felt were necessary either to refresh their knowledge or to learn new things. Beck et al (2002) say that active learning is more effective than passive, noting that learning styles are particular to the individual. Therefore, we envisaged the need to use a variety of teaching methodologies. The programme would have to be flexible enough to fit in around the workload of the department as no protected supernumerary time was available. It had to be designed in a way to ensure the information could be imparted to all members of the nursing team without being overly repetitive, ensuring the same staff were not receiving the same teaching again and again. A four-week teaching ‘month’ was developed, with a different theme taught each week and a different topic each day. The senior medical staff and emergency nurse practitioners (ENPs) were supportive of this and agreed to cover the department while teaching was taking place. To minimise disruption to the service, it was decided to keep each teaching session to 15 minutes. To ensure patient flow was unaffected, sessions ran Monday to Friday when patient numbers tend to be fewer. The teaching sessions started at 1pm when we have the greatest number of nurses on shift and medical cover is usually at its peak. This ensured that the teaching reached the widest possible number of nurses. To help some of the more junior staff develop their teaching skills, nurses on the twilight shift, from 1pm to 1.30am, were encouraged to repeat the sessions with the nurses working the night shift. Any handouts or teaching aids were collated to provide a resource accessible to those not working that day. Low numbers of staff had trauma training, research found, so it was decided this would be the theme for the first training session. The other themes were safeguarding, medical conditions and minor injuries. Each of the deputy sisters was allocated a theme and, for their own development, was asked to devise the weekly programme. They could invite external speakers or staff from within the unit to deliver the sessions. Other than timings, no other guidance was given, which encouraged the deputy sisters to incorporate their own ideas and promote variety. The month proved successful, with teaching sessions of 15 to 30 minutes’ duration delivered daily, and with minimum or no disruption to the shop-floor and patient flow. A variety of teachers delivered information using many different teaching styles, including discussions of case studies, practical workshops, simulations and guideline reviews, thus maximising the potential to meet the needs of individual nurses. An example of one session is shown in Box 1. Aim To refresh knowledge of the process of preparing to transfer a critically ill child. Scenario Infant sustained head injury. Computerised tomography scan shows small subdural. No surgery required. Patient intubated and about to be transferred to paediatric intensive care unit (PICU). Learner plays the part of a nurse beginning night shift and taking over care of the patient. Has to prepare patient for transfer. Method Adapted simulation using a simulation doll made ready for transfer to PICU. A doctor role plays the anaesthetist (in a hurry to leave so the scenario is kept short and focused). A learner role plays the nurse taking over. Remaining learners act as ‘collective brain’ guiding the role player in tasks that need to be completed prior to transfer. Immediate feedback provided by facilitator and opportunity for reflective feedback from the learners. Some minor issues emerged over the month. On occasions, the unit was too busy at 1pm and it was decided to cancel the session. On reflection, this situation could have been easily corrected by either delaying the teaching or running a shorter bullet-point session. We gained formal feedback via a questionnaire sent to each nurse who attended a session, and informal feedback was received verbally during and after the sessions. Examples can be seen in Box 2. From this feedback, it was clear that staff appreciated the chance to have interactive workplace learning which allowed them to consolidate their theoretical knowledge. The informal set up meant they felt comfortable raising questions which they might be nervous about asking in front of a larger audience. We received positive comments about the topics, and were surprised at how many of the staff had not used the equipment we discussed in some of the sessions. This confirmed for us the importance of, and the need for, regular shop-floor teaching. Revalidation is on every nurse’s radar and gave our staff the opportunity to write a reflective account of the teaching sessions and of any follow-up learning, which could then go in the reflection and the continuing professional development sections of their Nursing and Midwifery Council revalidation portfolio. With the support of our medical and ENP teams, we were able to deliver an effective teaching package that met the learning needs of our nursing workforce. We are already planning our next teaching month and have decided to run them three times a year, with different staff members taking the lead. This, we feel, will empower the nurses as they can choose the subject and direction of the teaching. With the RCN National Curriculum and Competency Framework for Emergency Nursing now in place, the subjects we teach can be co-ordinated to align with nationally recognised needs. We feel that the package we designed could easily be adapted for use in other EDs struggling to find the time to provide nursing education. Beck A, Bennett P, Wall P (2002) Communication Studies: The Essential Introduction. Routledge, London. Royal College of Nursing (2017) National Curriculum and Competency Framework for Emergency Nursing (Level 1). RCN, London.